As described in a previous post, my experimentation with a personal blog using wordpress.com beginning in July 2006 helped me get familiar with the technology and see for myself how we might use it on Mayo Clinic's behalf. I also got a taste of the search engine optimization (SEO) benefits of blogging when visits to my fledgling blog increased significantly after a post became the #2 result on Google for a "dr. max gomez" search, ranking even ahead of his Wikipedia entry. To get traction for blogging at Mayo Clinic, however, we needed more people to become comfortable with it. At that time WordPress.com offered a $30 per year private blog upgrade option. So we created a private blog in January 2007 for Mayo Clinic Public Affairs. Only our staff members who had created wordpress.com accounts and had been added as authorized users had access. Go ahead and try to see it. This blog in essence became a private sandbox for our staff, so they could experiment safely without concern about making mistakes in public. 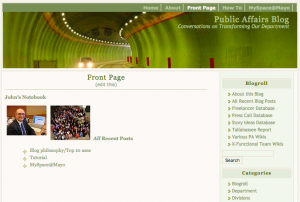 Our first public blog was for the Nov. 2007 Transformation Symposium. One of our concerns about blogging had been that if we started one we would be expected to keep it updated and fresh with new content. By having the blog associated with this event, which had a defined end point, we avoided that open-ended commitment. With health care reform on the horizon, Mayo Clinic had established a Health Policy Center, so in March 2008 we published the first post on the Health Policy Blog. We started the Mayo Clinic Podcasts blog in April 2008 as a means of enabling users to find individual podcast segments instead of requiring them to subscribe to a topical feed. In May 2008, we kicked off the Mayo Clinic News Blog, with password-protected posts providing access to audio, video and image files. We had one password per post, which we included in news releases we emailed to journalists. You'll note that none of the bullets about the blogs above contain links, because they've been replaced by other offerings as our blogging and online community development has evolved. 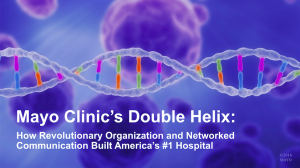 One of the early blogs that is still active is Sharing Mayo Clinic, our patient story blog that launched in January 2009. It also started on wordpress.com before we eventually moved to a self-hosted WordPress solution. Because we used domain mapping, the migration was invisible to blog readers. Meanwhile, my personal blogging journey also continued. Actually, it went just a bit ahead of what we did at Mayo Clinic. After I implemented changes on my own blog, I could confidently suggest application in our Mayo blogs. In January 2008 I renamed my blog Social Media University, Global (SMUG), bought an appropriate domain name and applied it to my wordpress.com hosted blog. In January 2009 I rented server space and migrated SMUG to self-hosted WordPress, which gave me more control over the plug-ins and other features I wanted to implement. With my own online university, I naturally named myself Chancellor. While SMUG was a fun, tongue-in-cheek construct, it had a serious purpose of helping mid-career communications professionals make sense of social media. SMUG also contained the seeds of what has become the Mayo Clinic Social Media Network (MCSMN). As I engaged online, I met and learned from many colleagues from across the U.S. and around the world, and through MCSMN we wanted to provide a gathering place for that learning and sharing of best practices in the health care context. Our in-person learning and networking events, including Social Media Residency and our Annual Conference, as well as our CME-accredited online Social for Healthcare Certificate, are major improvements over the informal, makeshift SMUG curriculum. This significant Mayo Clinic investment in social media came only after we first demonstrated its potential through direct Mayo Clinic applications in the work I was originally hired to do, which was media relations. I'll be sharing some of those stories that helped us on the journey in future posts. Ever heard of SMUG, the forerunner of MCSMN? A private blog can be your own personal sandbox for making mistakes while you learn to master digital marketing.